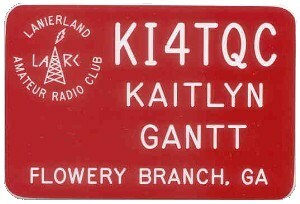 The Lanierland Amateur Radio Club, Inc. is based in Gainesville, Hall County, Georgia. It covers the Lanierland and NE Georgia Area. The club stands ready to serve the community in times of disaster or other needs. LARC Membership is open to all licensed amateurs and their families. The 2 Meter repeater is a Motorola MTR 2000 Repeater. The 440 MHz repeater is a Motorola MSF 5000 Repeater. The 220 MHz repeater is a GE Master II repeater. This system is connected to a "hub" 440 repeater on Oglethorpe Mountain which in turn links to several other 220 repeaters in adjoining states. You can learn more about the club by visiting the Lanierland ARC web site. The LARC badge is red with the club logo in white on the left and your call sign, name, and home town on the right, also in white. The LARC badge is $11.00 and includes a safety pin fastener. Click here to see other fastener choices. To order, please select the "Lanierland ARC - Gainesville Ga. Badge" option using the CLUB ITEMS drop-down menu on our order form. Please remember to include your personal information with your order. Click here to see our optional fasteners.